DESCRIPTION: Charming year round home that offers water and mountain views over Somes Sound from the expansive deck. 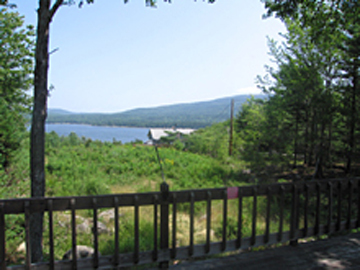 Centrally located with lots of space, this will be the perfect place to spend your Maine vacation. The home is wheelchair accessible and also comes with a large boat mooring (2 ton), shared dock, tender, an available ramp for small boats and trailer storage. LAYOUT: West Wing: 1/2 bath, eat-in kitchen with seating for four, open to the living room with large fireplace and sliders to the deck. Full bath. Bedroom with 2 twin beds. Master bedroom with a king bed. East Wing: Bedroom with a king bed, full bath and access to the deck. 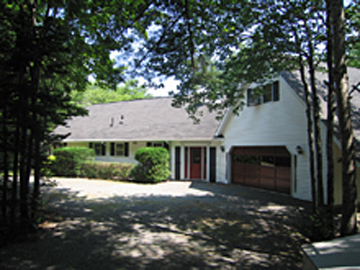 OTHER: Large finished room above the garage offers additional sleeping space with a queen bed and two twin beds 1/2 bath and a water view deck. This area is accessed via an exterior back staircase off the lower deck. OTHER: Basement level: Game room with kitchenette, ping pong table, tv, Franklin fireplace and 1/2 bath.